The cover painting, by Beatriz, depicts a Zapatista community farm. An important book argues that conservationists who focus on creating nature preserves are undermining their own cause. To truly protect biodiversity, environmentalists must support the global struggle of peasant farmers for human rights, land, and sustainable agriculture. In any discussion of biodiversity and species extinction, someone insists that overpopulation is the problem. 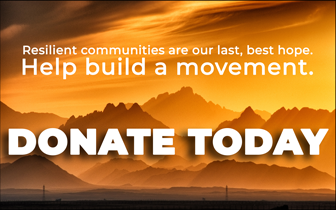 More people equals more farms equals less wilderness equals more extinctions. Life is a zero-sum game: you can have people and farming OR wildlife and biodiversity, but not both. 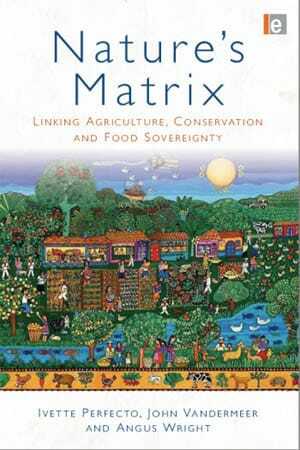 For a convincing antidote to such views, I highly recommend Nature’s Matrix, an important book by ecologists Ivette Perfecto, John Vandermeer and Angus Wright. Drawing on their extensive practical experience with conservation and agriculture in Central America and the Amazon, combined with recent research in ecology and agronomy, they propose a radical “new paradigm” for conservation, a strategy based on powerful evidence that preserving biodiversity is inseparable from the growing struggle of peasant farmers for human rights, land, and sustainable agriculture. The issue is not how many people there are, but what the people do: some forms of agriculture destroy life, others preserve and expand it. Only by strengthening the social forces that support biodiversity-friendly farming can we hope to slow or reverse what’s being called the Sixth Extinction, a global species annihilation comparable to the death of the dinosaurs. Most conservation groups follow that approach: they try to protect biodiversity and limit species extinctions by creating wilderness reserves where human activity is limited or banned. Often they literally erect fences and pay armed guards to prevent intrusions, even by people whose ancestors lived on the land for millennia. What happens outside the reserves is only relevant if it threatens to impinge on the pristine environment where nature is protected from people. Nature’s Matrix argues convincingly that such a focus on creating protected areas is a doomed strategy that actually harms biodiversity, increasing the likelihood of extinctions. This is so for three reasons. First, most tropical landscapes are not exclusively untouched or exclusively farmed. 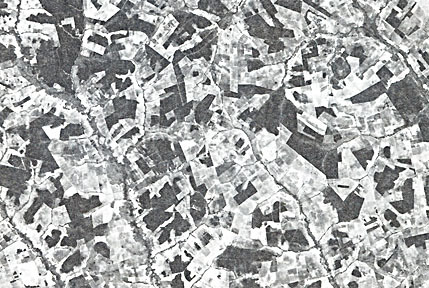 The most common pattern is a complex matrix with fragments of forest separated by a variety of farms, as this aerial photograph illustrates. Despite the sincerity and hard work of conservationists, nature preserves will never represent more than a small fraction of biodiversity-rich areas. Second, within natural habitats, even large ones, local extinctions are normal and inevitable. “Each subpopulation faces a certain likelihood of extinction. Accumulated evidence is overwhelming that extinctions, at this local subpopulation level, are ubiquitous.” (6) Local populations must be constantly reinforced by migrations from other areas. “As long as the migration rate balances the extinction rate, the population will survive over the long run.” (196) If migration is blocked or seriously inhibited, eventually all of the local populations will disappear and the species will be extinct. Some kinds of agriculture block such migration, others facilitate it. What kind of agriculture is most likely to produce a high-quality matrix? The intuitively obvious answer is confirmed by research. The authors aren’t naïve: they recognize that traditional farming isn’t always sustainable, and that some of what poses as organic farming is little different from industrial farming. Nor do they suggest that a single model applies everywhere: the most sustainable forms of agriculture depend on the farmers’ detailed knowledge of local conditions and their ability to adapt as conditions change. Nevertheless, experience and research show that a combination of traditional knowledge and the latest agro-ecological research can produce results that are biodiversity-friendly while producing as much food as high-input industrial farms. Unlike most books on environmental issues, Nature’s Matrix doesn’t limit itself to a description of the problem and pious wishes that “political will” for change will somehow emerge. Instead it asks what social forces can be mobilized to change the dominant agricultural model. Clearly, we cannot expect change to come from the corporations that profit from ever-increasing use of pesticides and artificial fertilizers. Likewise, the giant food growers and processors whose empires depend on monocrop plantations are no friends of biodiversity – nor are the governments and international agencies that do their bidding. But a countervailing force is growing. Some may call that conclusion utopian, but what’s truly unrealistic is the belief that small islands of biodiversity can somehow survive in rising oceans of industrial agriculture. 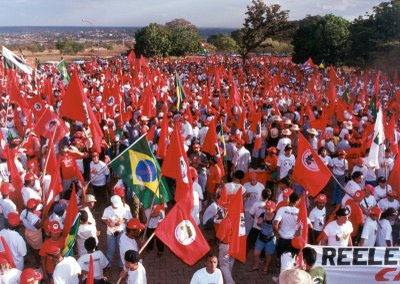 Without an agro-ecological revolution, the Sixth Extinction cannot be stopped – and without the active involvement of mass peasant movements, the agrarian transformation cannot succeed. Perfecto, Vandermeer and Wright have written a powerful social and scientific critique of current conservationist policies, and have outlined the basis for a radical alternative. Nature’s Matrix should be read and heeded by everyone who is concerned about the survival of life on earth. Ian Angus is editor of the ecosocialist journal Climate & Capitalism. His recent books include Facing the Anthropocene and A Redder Shade of Green, both published by Monthly Review Press.